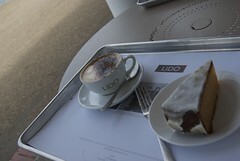 I was delighted to see the lido by the Serpentine is now flourishing again with a very fine café. Not only is the exterior of the building restored and a pleasure to sit outside but they serve a really nice marmalade cake. I am sure Paddington would approve. Nice coffee too although I am not sure if it was from Peru or elsewhere. A lot of my coffee seems to come from the elsewhere plantations. Before ordering those essentials of a day out, tea and cake, have a look at the interpretation boards at the far end of the interior. 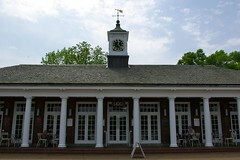 They have a history of the lido and plenty of interesting images too. There are chairs and table beside this. I may have worried a fellow customer as I was peering intently at some of the old images in close proximity to their table! One piece of advice is be prepared to make new friends if you sit outside. These will be of the feathered variety and want to know you for your cake not your sparkling wit. 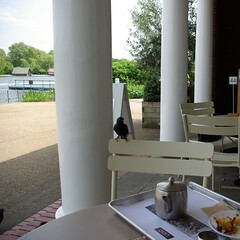 The pleasure of the view across the serpentine and early morning in the park is worth the feathered attention though. Whilst walking through the gardens keep an eye out for the bright green parakeets. They are descendants of some that escaped some time ago and are very hard to photograph but it was fun trying. I was surprised they had survived the 2009-10 winter but feathers are good insulation!